The world’s first and only permanent insect-repellent clothing range. Our insect-repellent treatment is permanently woven into the fabric and is proven to reduce bites by up to 90%. 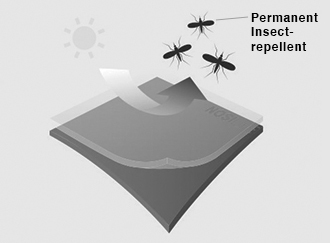 Insect Shield is a breakthrough in textile innovation, utilising a new and unique permanent anti-insect technology. Tested by an independent testing laboratory, Insect Shield provides proven protection for the lifetime of your garment. Insect Shield is designed to provide a barrier against biting insects that can cause life threatening diseases such as Malaria and Zika Virus. With insect borne diseases affecting up to 700 million people worldwide every year, choosing insect repellent clothing can help to take the danger out of your next adventure. Designed for use in hotter climates, the Insect Shield range also incorporates a moisture wicking ability to absorb moisture from the skin which keeps you cool and comfortable in the heat. Insect Shield is suitable for waterside activities too, where midges and ticks may be present. Take a closer look at the range now.